Bring your family or a few close friends with you on an unforgettable escape to the Smoky Mountains! Your new home away from home has it all - lovely natural views, amenities like a private hot tub, and a low-key, relaxing atmosphere. And you can even bring two lovable canines with you, too! 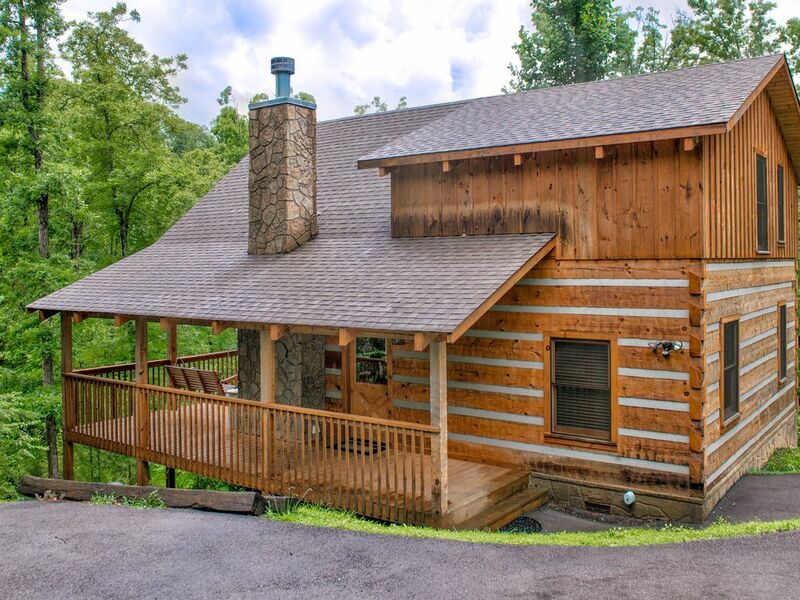 Located near the charming Tennessee town of Pigeon Forge, this multi-level cabin sits on a hillside overlooking swaying trees and a rolling field. The deck gives you an amazing space to take it all in - or to simply relax in the private hot tub! Inside, you'll marvel at the woodwork on the walls, floors, and ceilings, as well as the homey furnishings and cute decorative touches. The living room is a great place to take in the welcoming atmosphere, with easy access to the deck and a plush leather couch for snuggling up with the people you love the most. Warm up by the seasonal fireplace and enjoy Blu-ray movies and cable on the flatscreen TV, or try a friendly game of air hockey by the staircase! Nothing's as tasty as a home-cooked meal with your loved ones - though preparing it with a top-notch kitchen certainly couldn't hurt! Stainless steel appliances, granite countertops, and two gas grills outside give you everything you need to whip up something tasty. Savor the fruits of your labor at the breakfast bar for three, the indoor table for four, or out on the deck. Don't worry about cleanup - just leave it to the dishwasher! Two sleeping areas in the upstairs loft allow four guests to stay in peace and comfort. Two well-behaved dogs are also invited for a small nightly fee (30-pound limit per dog, please). Both the luxurious king-size bed and twin-size bed with a trundle sit in gorgeous cast-iron frames. After a long, relaxing night, wake up to start a load of laundry in the private washer/dryer before showering in either of the bathrooms. Just to the south is the unparalleled natural beauty of the Smoky Mountains. Great Smoky Mountains National Park has everything from hiking and horseback tours to wildlife viewing. River Rat Tubing is close by, and lets you enjoy a whole new side of the area as you bob down the river. Pigeon Forge, meanwhile, gives you plenty of shopping and dining, as well as family-friendly attractions like Dollywood and WonderWorks. Place your reservation today and preserve a vacation you'll remember for the rest of your life! Amazing cabin! It was super clean and with all the necessities you could want. I was a little worried about being too close to a bunch of other cabins but it is located in a secluded, quiet area away from town but still close enough for getting groceries, etc. It's on a beautiful wooded lot that the pup loved running around on. The king sized bed was really, really comfortable which was unexpected and appreciated! It also has a lovely wraparound deck where the hot tub is and we loved relaxing out there. It's the perfect place to relax. We can't wait to go back. Look no further!! A+++ I have stayed at many cabins in the area and this cabin by far was the best. To say the house was clean would be an understatement! Everything was very tidy and I felt at home as soon as I stepped in the door. Through the windows, you will find that no other cabins are visible and if you desire seclusion and the true mountain feel then you will find it here. All of the appliances worked properly and were not outdated. The porch wraps almost completely around the house. At night you will hear nothing but the rain on the roof or the sound of nature. The cabin is located approximately 10 minutes from Pigeon Forge and 25 minutes from the middle of Gatljnburg. This is our #1 place to stay by far. Cabin was very nice and clean! Hot tub was amazing! Also a huge pro for me is the fact that the cabin has a security system, just gives me more reassurance when we were away or sleeping. The view and location is perfect. Far enough in the woods to feel secluded and only a 20 minute drive into Pegion Forge was very convenient. The only con I have to say would be I feel like there needs to be a second flood light put at the end of the house to light the whole driveway and sidewalk. Overall would definitely stay here again. My wife and I stayed in this cabin for four nights in January. It was nicely furnished and provided us with most of the comforts of being away from home.